The company has managed to deliver a 6.50% average increase in annual EPS over the past decade. AT&T is expected to earn $2.60 per share in 2014 and $2.72 per share in 2015. In comparison, the company earned $3.39 per share in 2013. AT&T has consistent history of share repurchases. The company has been able to reduce the number of shares outstanding from 6.17 billion in 2007 to 5.220 billion in 2014. The competitive advantage for AT&T is the scale of its operations, as evidenced by the number of subscribers it has. In addition, the company owns valuable spectrum, which is of limited quantities and is a deterrent for entry into the telecom market. Both AT&T and Verizon have scale that is unmatched at present times from the next two competitors. The wireless market in the US is close to a saturation point. However, a potential for growth includes data, and not just the type used by ordinary consumers, but machine-to-machine use. The drawback is the fact that telecom service is essentially a commodity, which is why differentiation from one carrier to another is difficult, if there was a price war. In addition, there is the need for constant capital expenditures to maintain the quality of the network and keep up with the times. Given the competitive nature of the telecom industry, and the constant need for technological upgrades merely to keep up with the next big wave, it is highly unlikely that companies like AT&T will provide outstanding stock performance. However, they should do okay for those who need a high dividend today and who do not mind having their income mostly keeping up with inflation. The company could also grow through strategic acquisitions. It is an embodiment to acquisitions, since it was spun-out of the original AT&T in 1984 and named SBC. After a series of acquisitions, SBC acquired AT&T (ma-bell) in 2005, and then promptly changed its name to AT&T. The company has a track record of successfully integrating acquisitions, which is no small feat. AT&T has recently announced that it would be acquiring DirectTV (DTV). This could help it offer bundled services to customers at a greater scale. It could also pave the way for international expansion beyond TV for AT&T. AT&T could generate synergies from the deal. AT&T expects cost synergies to exceed a $1.6 billion annual run-rate by three years after closing. These synergies include things like programming cost reductions, operational efficiencies and reductions in redundant broadcast infrastructure. Programming cost reductions are the most significant part of the expected cost synergies. The company also expects synergies from bundling services, advertising, etc. AT&T has grown through acquisitions in the past, which is why I believe integration risk to be low. I especially like that AT&T will be able to offer consumers a bundled service, which would be a differentiator in many key markets. 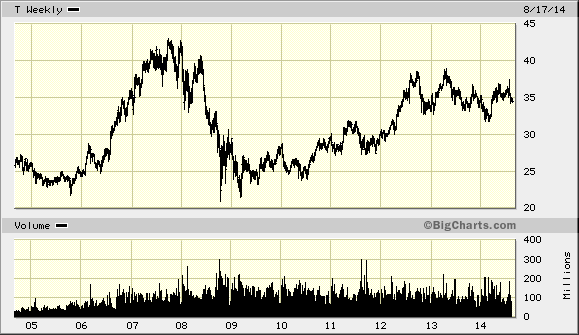 Plus, DIRECTV could easily increase earnings over the next five years. Average analyst estimates are for earnings to grow by 8.60%/year over the next five years. This could translate into earnings growing to $4.30 billion by 2019, from the current $2.86 billion in 2013. This would be driven by growth in Latin America, where fixed line access is limited, and where a large portion of customers are joining the ranks of the middle class. The annual dividend payment has increased by 4.80% per year over the past decade, which is lower than the growth in EPS. 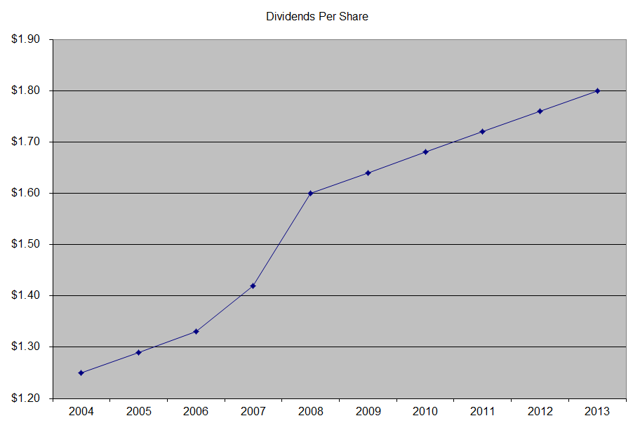 Since 2009, AT&T has managed to raise annual dividends by 4 cents/share, or about 2%/year. I would expect future dividend growth to be close or slightly exceed the rate of inflation over the next 10-15 years. A 5% growth in distributions translates into the dividend payment doubling every fourteen and half years on average. If we check the dividend history going as far back as 1984, we could see that AT&T has indeed managed to double dividends every fourteen and a half years on average. 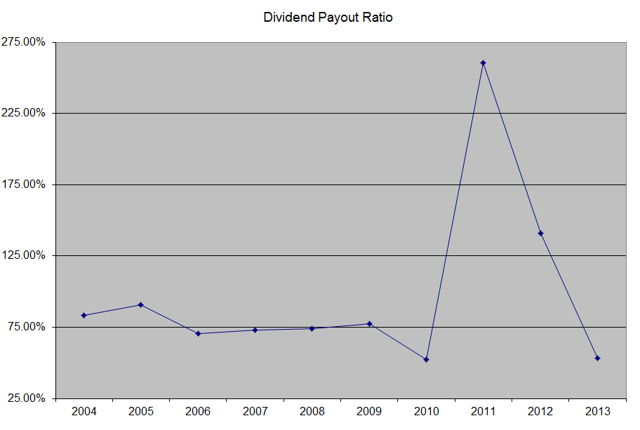 In the past decade, the dividend payout ratio has been all over the place, ranging from 52% in 2010 to 260% in 2011. 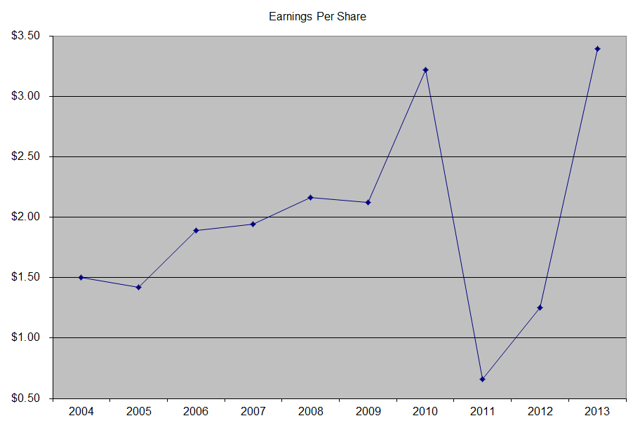 Of course, this was caused by the effect of one-time items on earnings per share. A lower payout is always a plus, since it leaves room for consistent dividend growth, minimizing the impact of short-term fluctuations in earnings. 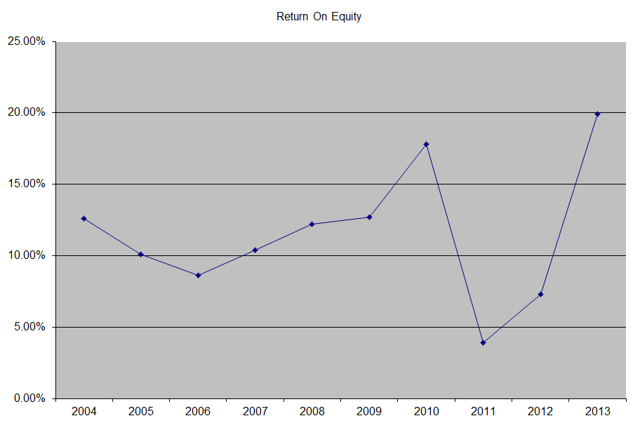 AT&T has been able to generate an unimpressive average return on equity of 11.55% over the past decade. With the exception of a couple years where we had large one-time adjustments to earnings, this indicator has been relatively stable, however. I generally like seeing a high return on equity, which is also relatively stable over time. Currently, AT&T is attractively valued at 13.30 times forward earnings, and has a dividend yield of 5.20%. Investors who purchase AT&T today should not expect much in terms of dividend growth over the lifetime of their investment. The most likely scenario is that dividend income merely keeps up with inflation over time, which is not too bad of an outcome for some. Thus, AT&T has mostly been purchased by income-hungry retirees, who need the current income today, and are fine even if the income slowly loses purchasing power over time. Since I have a 15-20-year investment horizon, and because of the slow growth in earnings and dividends, AT&T is not a company I am currently considering.